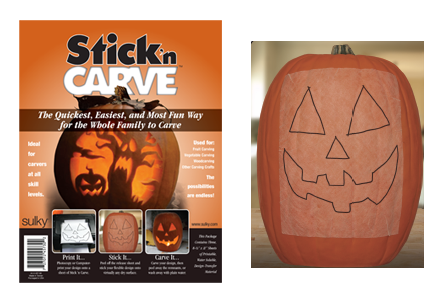 Stick ‘n Carve: A Pumpkin Carving Must Have! It will soon be pumpkin carving time and while using a professionally designed stencil is essential, transferring those patterns onto the pumpkin via the traditional methods can be time consuming and frustrating. Gravefully, Sulky has introduced a revolutionary product: Stick ‘n Carve. You print out your pattern on the special sheet, peel off the backing, then stick it onto the pumpkin like a sticker. You can easily carve right through the lead and acid-free material with ease and the material does not shift, lift or misalign. Super easy and quick since it eliminates one entire step. What makes this sticky paper incredibly unique is that you can reposition it, it peels off the pumpkin easily, and for thin areas with very intricate/delicate cutting, you can rinse and dissolve the transfer sheet with warm water. It’s literally Halloween miracle! See the video tutorial below and order these at ZombiePumpkins.com, Uncommon Thread, and ShopJoya.com.